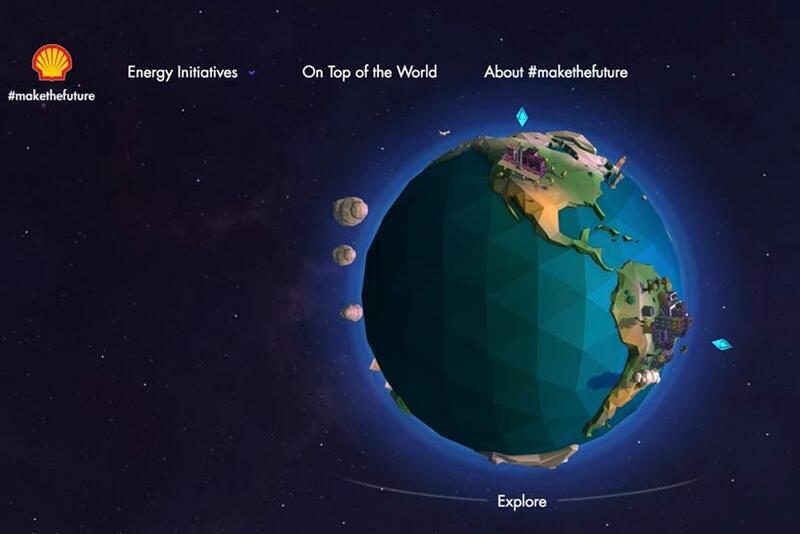 Shell has collaborated with Oath and MediaCom on the next phase of its "Make the future" campaign, allowing consumers to interact with an animated globe and explore its alternative energy efforts across the planet. The next stage enables consumers to delve deeper into the five cleaner energy projects that were highlighted in its #makethefuture music video, which features popstars Jennifer Hudson, Pixie Lott, Luan Santana, Yemi Alade and Monali Tahkur singing Imagine Dragons’ On Top of the World. Oath’s Ryot Studio, working in conjunction with Unit 9, has created a WebGL "globe" activation, which users can visit on Shell’s Tumblr site. Visitors can interact with the animated Planet Earth, turning the model with their mouse cursor and then zooming in on regions where Shell is working in alternative sources of energy. For instance, if a user "visits" China, they can access an informational video on a clean cooking initiative. Elsewhere, in the UK, Shell is working to create cleaner forms of transport using hydrogen-based fuels, while in Brazil the energy giant is creating sustainable and cleaner sources of light for families and children. The campaign is being targeted at people's devices using Oath's base of one billion users. The content is aimed at millennial audiences across five markets: the UK, US, Brazil, Singapore and India. It will reach them via Tumblr and Oath's Yahoo Gemini and BrightRoll premium video distribution and syndication channels. John DeVine, Oath's chief revenue officer, said: "The future of energy is an important global topic. Our team worked with Shell and MediaCom to bring a new, interactive angle to their music video that engages audiences around this message. By combining the creativity of Ryot Studio and Tumblr with our premium video distribution channels, we’ve created a holistic experience for millennials across five markets to explore projects that Shell has highlighted as helping solve tomorrow’s energy challenges." Shell is currently reviewing its global creative and media agency arrangements, which lie respectively with J Walter Thompson and MediaCom.